Originally posted at Habitat for Humanity of Greater Los Angeles Three years ago, I was recently divorced, had just sold my own home at a massive financial loss, and was renting for the first time in 14 years. That’s when my friend and fellow single mom Eda Benjakul invited me to a Habitat for Humanity of Greater Los Angeles (HFH GLA) fundraiser. I went, hoping it might take my mind off my own troubles. I was first taken in with the positive spirits of leaders Erin Rank and Alison Treleaven, and knew I wanted to be involved. When I heard from the single mom recipients, who dreamed of owning a home for the first time, I was humbled. I hadn’t realized that instead of being given homes, they had to help build their own house as well as build for others in need. The Habitat philosophy of “teach a [woman] to fish” was empowering them to make their home worth working for, and they were paying the mortgages too, something I had since been unable to do for myself. 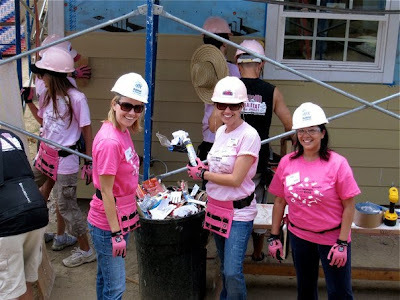 A few months later, I was invited to participate in a Hollywood for Habitat for Humanity (HFHFH) “Power Women Power Tools” event, and to be honest, I was terrified. I had supervised the design and building of my dream home when I was married, but that was the easy work of picking out faucets, hinges, tiles and doors. I had never hammered in any nails or sawed any wood; that was left to the construction guys. My own husband didn’t know how to use a power drill to hang the curtain rods. I had seen firsthand how precise each cut of wood must be to make the house sturdy and how dangerous a construction site can be. I wondered: how was I going to put on a hard hat and operate power tools? What if I screwed up, sawed off a finger or swung a hammer and accidentally hit someone? I’m known for being clumsy. But I remembered that these homeowners were building houses for themselves and others without any experience either. So I mustered up my courage and went for it. On the day of the build, I rounded up my then 10 and 12-year-old boys to come with me. Believe it or not, these Habitat people had thought of everything when it came to putting power tools in the hands of moms, even babysitting. My boys complained the whole way down to the site. “Can’t we just stay home and play video games instead?” But then we got there, and during the meal before we started building, two gentlemen from the HFHFH board got up to speak. One was Tom Shadyac, the director of Ace Ventura: Pet Detective, which was one of my youngest son’s favorite movies. He made the boys laugh and psyched them up. The other was screenwriter and director Randall Wallace, an HFHFH founder, who introduced the women whose homes we were building that day. My older son, who wants to write and direct stories that move people, was himself moved by Randall’s mission to serve. As the mothers spoke of how much it meant to them and their children, my kids finally got it. They happily went off to the kid’s tent and didn’t make another peep. I put on both my pink T-shirt and pink hard hat to scurry off with my team. First, construction supervisors briefed us on how to measure wood, use the power saw, which pieces go vertically in a door frame and where to put the nails. I tried not to panic as I feared I wasn’t strong enough or man enough for this task, but then I turned and saw the woman we were building for. I found my resolve, so I operated the power saw and actually used a nail gun! If we messed something up? No problem. Nothing went to waste; it was recycled or reused elsewhere. I was feeling pretty darn macho after a while. After we framed a few windows, we got to the plywood, and it was starting to look like an actual house. As the walls went up, the construction crew handed us all sharpies to sign our well wishes to the future occupants. I found this part to be the most moving of all. Even when covered by paint, our messages of love would always remain in this home with the family. When it was time to leave, I walked by all the women I knew on the other teams who were working and laughing together, and I felt quite satisfied. We actually had fun challenging ourselves and delighted in getting to know the homeowners. I went to the kid’s tent and found my boys didn’t want to leave. Smaller kids were surrounding them as they supervised the building of toys and kid’s furniture for the new home’s children. The babysitters told me that my boys were natural leaders. When we started to head out, the youngsters trailed behind them. Were they really the same boys who had been complaining the whole way there? On the ride home to our modest rental house, my kids told me how proud they were of me for helping those families. Tears streamed from my eyes. I was proud of them too and grateful that we had a roof over our heads, by whatever means we had. I have volunteered for Habitat for Humanity ever since, helping to build new homes for these incredible and inspiring single moms that I have the utmost respect for. They have stepped up to the challenge of owning their own homes, by taking an active stake in their construction and responsibility of ownership. By working together, both the builders and recipients each share in a very rewarding experience. That’s why each year, you’ll find me revving up the table saw with a little more confidence, as we enthusiastically challenge ourselves with power tools to be empowered women.